interferes with television station 51 in those areas. In general, it won’t be available in those circle areas until the stations move to another station (frequency). You can click on the map and easily zoom into your area, seeing where towers are generally located and if they are supporting Band 12. The challenge with this information is of course keeping it up to date and the site was last updated in October of last year. That isn’t terribly old but I would suspect there are some areas that have coverage but haven’t been identified on this map just yet. 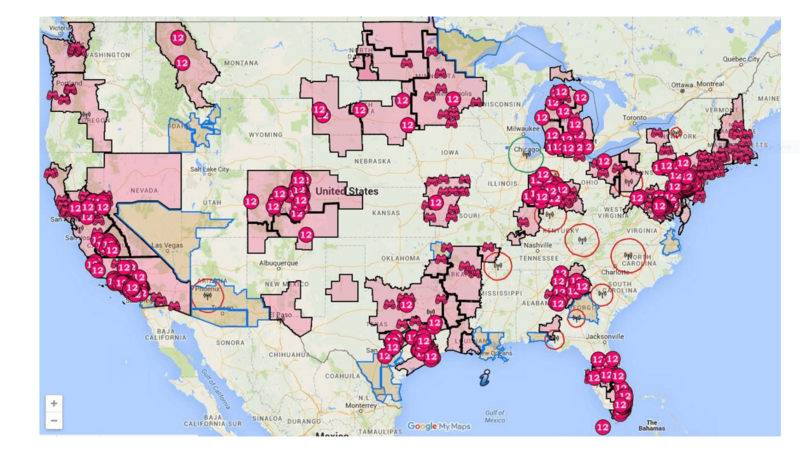 As I posted last week, T-Mobile has big expansion plans for the 700MHz frequency in 2016 so I fully expect this map to update with a lot more coverage as we go throughout the year. Regardless, a wealth of information on this map and this site for Project Fi and T-Mobile users.